Weekly Roundup 11.1.17: Hunger and Homelessness Awareness Week, SAMHSA Webinars, MDHI Blog, DOH Position, and More! This webinar will explore similarities and differences of housing instability in rural and urban environments, address common barriers, and identify evidence based and best practices for person-centered approaches. The presenters are housing specialists with extensive experience in serving people with mental and substance use disorders in both rural and urban/suburban areas. They will explore individual and cultural considerations and ways to use best practices across a range of communities. The Division of Housing (DOH) is hiring a temporary Housing Navigator position. This position will be responsible for identifying and coordinating housing placements for the Homeless Solutions Program participants. The announcement period is set to close November 6th, but may close earlier if suitable applicants are found before that date. The Housing Navigator will play a key role in the success of the Homeless Solutions Program (HSP) by identifying and coordinating housing placements for HSP participants statewide, but primarily in the Denver metropolitan area. This position will coordinate with each program participant and the participant's case manager or other support staff to develop a strategic plan towards permanent housing placement; identify permanent housing units, engage landlords and property management staff, and liaison between all parties during the housing placement process; conduct outreach and engagement to landlords and property managers, both in person and via telephone and email, and will develop and maintain positive relationships with property owners and landlords; and assist with the lease-up and move-in processes where needed. "At USICH, we’ve been deepening our conversations with many of you about the concrete strategies we need to leverage to address racial inequities in our efforts to prevent and end homelessness. After digging in with leaders at our August convening and with partners at the Center for Social Innovation (C4SI), I wanted to share some of the ideas that have begun to surface." "Every element of this work can be underpinned by data; communities and national partners have begun exploring and implementing strategies to leverage a variety of data points and sources. 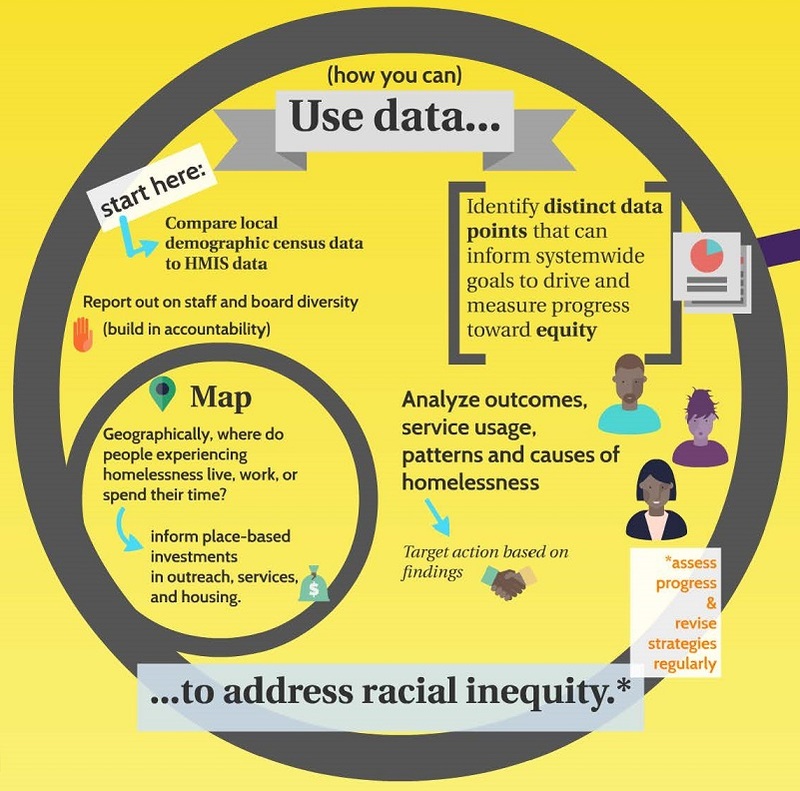 In the description and infographic below, we’ve outlined approaches and mechanisms for not only assessing the scope of racial and ethnic disparities locally, but also the action steps to take to measure and drive progress toward shrinking those disparities." Services Available: Employment Support, Benefits, Dental, Immigrant Resources, Pet Pantry, Cooking Demo, CO Affordable Legal Services, & Food Pantry.